Our community website was developed to serve as an informative resource for both our neighborhood and our local community. This is your website! Please feel free to contact us with your comments and suggestions. 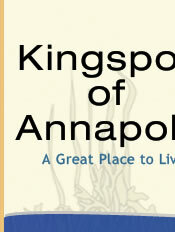 This is the only official Website of the Kingsport Community Association (KCA). Did you know that the Kingsport web page has message boards? These are a convenient way to share information and start a discussion within our community. Look for them under the Residents section menu.